With the draft only hours away, I thought a recap of the Redskins’ draft targets would be helpful. The list includes players the team wants as well as players that would fill needs or have been linked to the team in the media. Strengths: Intelligent, inspiring leader with the toughness to play through injury. Well-rounded skill set. Good size and athleticism. Accurate throws with promising footwork and release. NFL caliber arm strength and agility. Difficult to bring down. Weaknesses: Few glaring weaknesses. Limited experience working under center will create a steep learning curve. Arm strength a notch below elite. Not as physically gifted as Newton. Likelihood: Though reports indicate Shanahan wants Gabbert badly, the chances he will fall to the 10th pick are nearly non-existent. The Redskins have explored the possibility of trading up to draft Gabbert, but the team’s many holes make giving away precious picks too costly. Strengths: Rare physical specimen at 6’5” 248 lbs. Elite speed and agility. Very durable despite physical play. Big, powerful arm and solid release. Superior pocket mobility and dangerous ability to take off and run with the ball. Proven competitor and never gives up on a play. Enormous potential. Weaknesses: Grave character concerns. Can be selfish and overconfident. Below-average ability to read defenses and anticipate plays. Keeps the ball too long. Disastrous footwork. Raw in every way. Likelihood: The Panthers have their hearts set on Newton and will take him with the first overall pick. No way the Redskins get him. Strengths: Good size at 6’3 ½” and 211 lbs. Excellent route runner. Natural against zone coverage. Elite body control, impressive leaping ability and consistent hands. An acrobat with long arms, can catch seemingly uncatchable passes. Incredible competitor with fearless toughness. Weaknesses: Has had mild injury issues. Not as strong or impressive while running after the catch. Cannot match the physicality of some large and strong defensive backs. Suspended to begin 2010 season by NCAA. Likelihood: Slim. The Bengals and Browns both have pressing needs for wideouts and have higher picks than the Skins. Green is such a rare talent that teams who don’t need receivers also could select him for sheer value. Strengths: Rare physical specimen. Taller and more muscular than many WRs (6’3” and 220 lbs) with longer arms and bigger hands than most. Incredible speed, ran a 4.34 40-yard dash. Big leaping ability and excellent body control allow him to make ridiculous catches. Strong runner after the catch and shows effort and determination. A good blocker. Weaknesses: Biggest concern is that he drops too many easy passes. His below-average durability could also be problematic in the NFL. Likelihood: Jones has a better chance to fall to the 10 spot than Green, but the fact that both the Bengals and the Browns need receivers makes this scenario uncertain. If still on the board, I doubt the Redskins would pass him up. Strengths: Ideal build at 6’5 ½” and 290 lbs. Excellent football instincts. Has ability to anticipate the opposing quarterback’s movements. Outstanding work ethic. Always aware of where the ball is and has quick, strong hands. Excels against the run. Weaknesses: Not explosive on the first step. His pass-rush abilities are above average, but not exceptional. Lateral agility could improve. Lower body lacks strength of upper body. Likelihood: Good. The offensive players the Redskins most covet could all be taken before the 10th pick. The next logical choices are Watt and Quinn, who both should still be on the board and could fill big holes in the team’s defense. 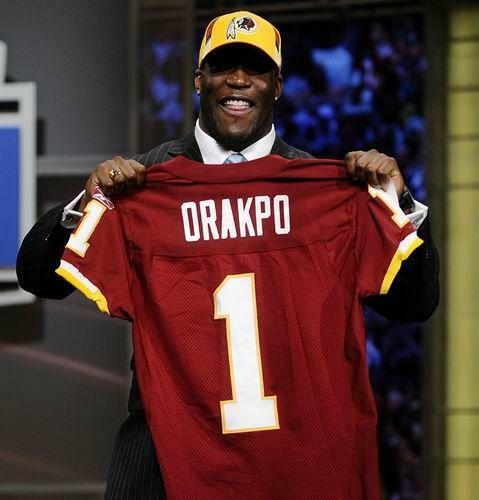 Defensive players are also more reliable selections in the draft, as Washington discovered when they drafted Brian Orakpo. Strengths: Exceedingly athletic for an average sized DE. Shows excellent speed (4.65 40-yard dash time, well above the 4.89 average) and lateral agility. Versatile enough to excel as a RDE in the 4-3 scheme or a ROLB in the 3-4. Elite pass-rush potential. Weaknesses: Average, not imposing, size (6’4” 265 lbs). Brain tumor in senior season of high school raises questions about future health. Strong work ethic cannot make up for sub-par football instincts. Has below-average ability to locate the ball. Likelihood: Good. As I mentioned with Watt, Quinn fills an immediate need and is less likely to be a bust than a WR or QB. The Redskins might favor Watt for his size, but could also select Quinn because of his versatility. Strengths: Very well-rounded and durable. Good character an asset for coaches and teammates. Intelligence gives him keen football instincts and in-game confidence. Prototypical size and speed. A natural with the ball. Physical player with above-average ability to anticipate routes and defend against the run. Weaknesses: Few glaring concerns. Can lose momentum when making sudden, full turns. Below-elite explosiveness. Sometimes a fraction of a count late locating the ball. Likelihood: Many analysts initially pegged Amukamara to go to Dallas with the number 9 pick. Prognosticators have backed off of that prediction and now forecast that Amukamara will be available to the Redskins at number 10. The team would probably prefer to take Watt or Quinn, however, if all three were still available. Strengths: Outstanding character, leadership, and toughness. Fearless competitor who will play through injury. Overall athlete, twice drafted by MLB teams. Superb arm strength and above-average pocket mobility. Weaknesses: Long history of injury. Does too little to protect his body. Can get anxious while in the pocket and make poor decisions. Below average accuracy and unnatural mechanics from within the pocket. Transition to NFL could be difficult. 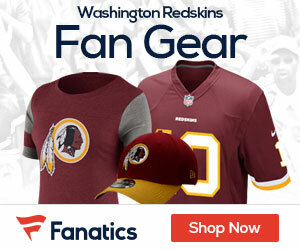 Likelihood: Will the Redskins use their number 10 pick on Locker? I very much doubt it. His talent does not merit such a high selection, but if the Redskins dislike their remaining options, they could certainly trade down and acquire him later. The trade down scenario has a good chance of happening, given the team’s few draft picks and many holes.